Living in Colorado isn’t so bad. I’ve barely begun to scratch the surface of the hundreds of hiking trails around Boulder let alone in Rocky Mountain National Park. 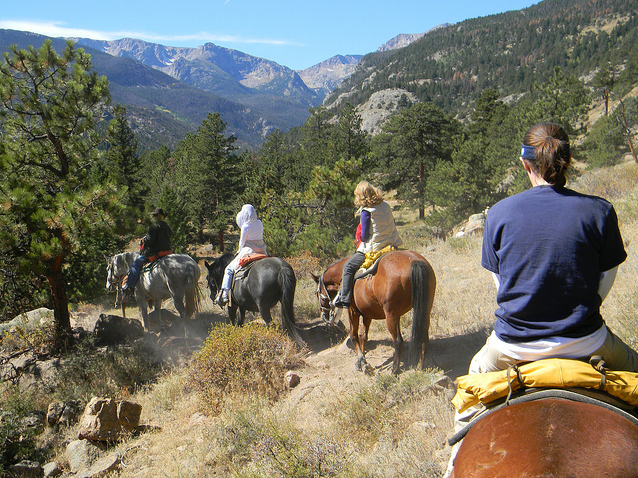 This week I’m going to get out and explore some of the park on horseback. I grew up riding horses as a kid and even showed a little bit when I was young. When we moved to SC I only really rode when I went to horse camps over the Summer. Going to camp was like night and day from my days of riding around a ring. It’s like going from a swimming pool to swimming in the ocean. We’d get lost in the woods off trail, get caught in thunderstorms, have our horses take off after getting stung by bees, you name it. It was scary at times but also pretty great to spend your day riding around the mountains. My favorite part was the night we’d pack in with our horses and camp in our sleeping bags under the stars. I think the rides I’m doing this week will be a lot more tame but I imagine the countryside will be pretty beautiful. It will be a great way to see more of the beautiful place I live in. I’m going to start with a 2-hour ride and then work up from there. I have a feeling I’m going to be pretty sore by the end of the week! Your description of horse camp brought me right back there. A few years ago my husband and I took the kids back up there for a weekend. The place has not changed one bit which was refreshing. Have fun riding again. You are currently reading Giddy up at 52 To Do.